Spanakopita Nistisimi (Lenten) is a Cypriot version of a vegan spinach pie which I remember eating when living in Cyprus but not the exact recipe. Yesterday I went to the farmers’ market again and among other things I bought the necessary ingredients to make Spanakopita. When I cook, I always like to improvise and add my own touch to the recipe or maybe something I saw in another recipe and I kept somewhere in the back of my mind waiting to be processed. I was planning to make a classic type of Greek vegan spanakopita, I always make but whilst I was washing the spinach I kept thinking about other ways of making a Lenten version (without eggs and dairy products). The spinach was more than a kilo, I had bought spring onions, dill, parsley and silverbeet. (The silverbeet was intended to be cooked tomorrow with black eyed beans). I’ve seen on Greek T.V. food shows women in the rural areas making hortopitta (a spinach pie mixed with several types of wild greens). Of course it’s rather difficult to get some wild greens in Athens but if I had planned this I could have found some at the farmers’ market. Anyway, as I had the silverbeet, that gave me the idea instead of using wild greens to experiment and add the silverbeet in the recipe. I would still make the usual one just in case it didn’t turn out good but this was a good opportunity for me to recreate a Lenten spanakopita I ate years ago in Cyprus but I did not know anything else about the recipe. I decided to make a small one by combining a couple of other Cypriot recipes. The classic spanakopita was the base for this one, the Cypriot bulgur pilaf with the bulgur wheat and vermicelli and finally from Kolokotes (the pumpkin pies) the almonds and raisins (but I did not have almonds so I used walnuts instead). The final result was fantastic. Usually, when eating nistisimi spanakopita it’s like eating a crust and a spinach filling which although aromatic by the herbs is still too much to each all that green inside. We do eat the usual Lenten version but it’s something we have to eat but don’t really enjoy. Here you have a filling with the bulgur wheat and vermicelli, which is by itself something tasty and you get a bite with a sweet raisin here and there and a bite of a walnut and all mixed together with the crunchy phyllo. Wash the spinach and silver beet and cut the stems, leaving only the most tender ones. Place them into a big pot, without water, and bring to a boil for about 10 minutes. They will become soft and their volume will be reduced. Place them in a colander to cool down and when they can be handled drain any water by squeezing them. Cut them into smaller pieces. Heat the olive oil in a skillet and sauté the onions until they have become soft but not caramelized. Add the vermicelli breaking them into small pieces and stir a couple of times, add bulgur wheat and also stir until becoming darker in colour. Add spinach in and stir. Finally add walnuts and sultanas. Let the mixture cool and mix in parsley and dill and stir. Oil a baking tin and roll out the phyllo. You can either make a big round tin or you can roll out phyllo in the pasta machine. For strifti (twisted) cut phyllo in two pieces and join them together. See instructions here. Place on the big side the filling and make it into a roll. Take both ends and twist a couple times into the opposite direction. Place into baking tin. When you finish with the procedure brush some oil and butter on top and sprinkle sesame seeds on top. If you are making homemade phyllo, don’t forget to brush each phyllo with olive oil and to sc0re the top. If using store bought phyllo, brush each phyllo with olive. Add half of the packet, add the filling and then the remaing sheets on top. Bake in a preheated oven to 180ο C for about 45 minutes – 1 hour, or until golden on top, depending on your oven. I am submitting this recipe to Chris, of Mele Cotte, who was diagnosed with thyroid cancer seven years ago. Chris is hosting the event Cooking to Combat Cancer 2, so let’s all contribute to this wonderful event by submitting a healthy recipe. The deadline for this event is by the end of this month so there is plenty of time to prepare and submit a healthy recipe. That spanakopita is the real deal, and not the spinach pie I made the other day. Hehehe. I love the personal touches you gave this dish. 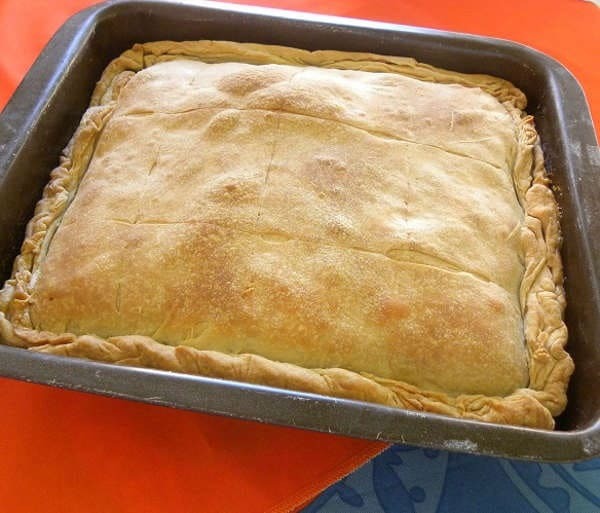 It’s amazing how us Greeks can be creative for Great Lent, with dishes like nistimi pita. We always like adding the sesame seeds on too. As for your “hand made” phyllo, isn’t that a misnomer being that you used a pasta machine to make the phyllo? Well, I didn’t use my feet to make it, so it is hand made, even with a pasta machine and not a rolling pin. Why use the rolling pin when I have a Kenwood Major Chef to do the job for me. Ben, your spanakopita was great. You did a great job. Bravo Ivy…I like the creativity behind this pita with the addition of nuts, vermicelli and raisins. Hand rolled or not the filo looks great. You cant beat the Kenwood can you? Well, it’s nice to record traditions, but we are in the 21st century, aren’t we? Nuria, Kopiaste is the most suitable word for an answer. Thank you Rosie, but I think it’s just a matter of experience. All looks wonderful! I love the combo of flavors here. My best friend growing up was Greek and I loved going to her house for her mom’s cooking. Wow – I miss those days! (Last I heard she was living in Thessaloniki.) thanks for participating in CCC2. It will be wonderful in the mix. Thanks sis. That’s good that you finally found rennet. Thanks for the compliment. Great creativity, Ivy. It sounds absolutely wonderful and is definitely hand made filo, no question about it! Cynthia, I wish there was a magical way I could have you as well as other friends from the blogosphere over for dinner. Laurie, I thank you for agreeing. Even if it’s on a pasta machine the final result is the same. These look brilliant Ivy, and definitely very healthy with all of that greenery. Oh Ivy this looks great! I love bulgur and spinach and I’m sure this is delicious! Thank you Mary, I am glad you think it is good. Whoa, Ivy. This looks like a flaky, spinachy stromboli. I wish I had a whole tray of them RIGHT NOW! A tray is in the mail for you Heather (wish it could be done).